This is not the post I expected to write today. I thought my theme would relate to our experience having dim sum with Runsketeer KWL this morning, or how much difficulty I had during yesterday's run. Instead, I'm going to talk about the curious incident of the dog in the run-time. 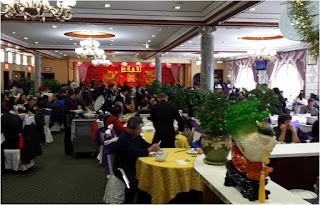 Earlier in the day, the Emerging Runner family got together with our buddy KWL for a delicious (and filling) meal at a cool place in Flushing, Queens. 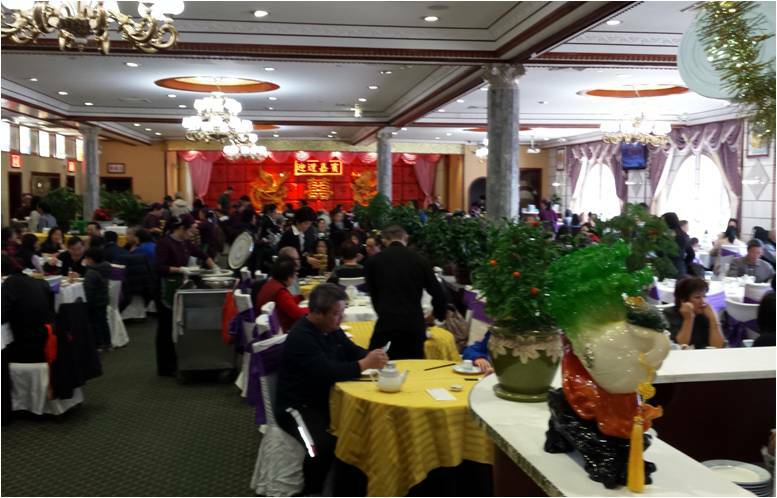 Dim sum (per Wikipedia) is a style of Cantonese cuisine prepared as small bite-sized portions of food traditionally served in small steamer baskets or on small plates. We had a great time, tried a lot of new foods and didn't need to eat again for the rest of the day. Our schedule was tight this morning and I wasn't able to run before we met up with KWL. Although I prefer running early, I was left no choice but to go out later in the day. As I'd mentioned above, Friday's run was tough. It was a combination of end of week fatigue, 19 MPH winds and real feel of 20°. Today was nine degrees warmer and the winds were somewhat less intense and I got off to a good start. My goal today was to cover 3-4 miles depending on how I felt. I was inspired by something I'd read in Runner's World that suggested running your usual route backwards to keep things interesting, I did that for the first half and then settled back to my usual direction. It was shortly after I'd passed my third mile that I encountered my attacker. There were a number of people walking dogs this afternoon and I saw group about a hundred feet ahead of me. As I got closer I realized they had two dogs, one small and the other a large standard poodle. They were walking with traffic on the right side of the road, on the same side as me. As I passed them by, the poodle jumped towards me and, although I shifted to the right, the dog managed to clamp its jaws on my left forearm. 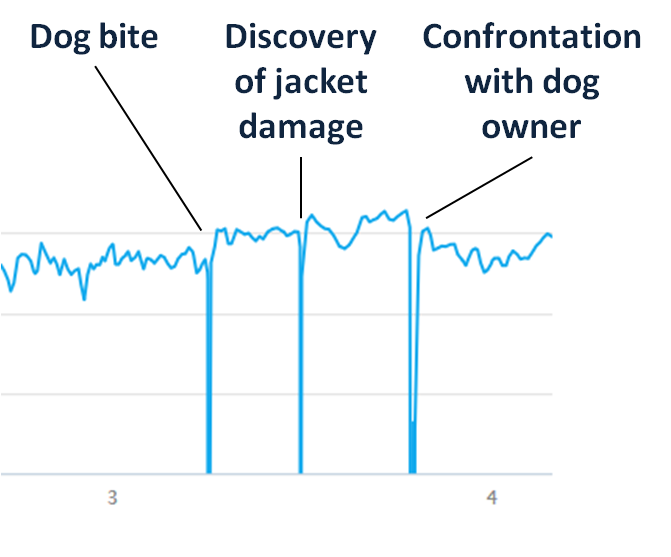 Fortunately, I was wearing my ASICS running jacket that prevented the dog's teeth from breaking my skin. I pulled my arm away and yelled, "your dog just bit me!" The owner said "Sorry" and I went on my way, thinking that it was nothing more than a scare. About a quarter mile further I turned my arm and saw that the dog had ripped a big hole in my sleeve. I was mad and decided to retrace my route in hopes of intercepting the dog's owner down the road. I really liked that jacket and I wanted these people to be accountable for the damage. The group wasn't where I expected them to be, and I kept running until I caught them on a connecting street. I was upset and told the guy that he owed me for damaging the jacket. He said, "Absolutely" and offered to pay, saying he'd bring me a check by that night. And he did! 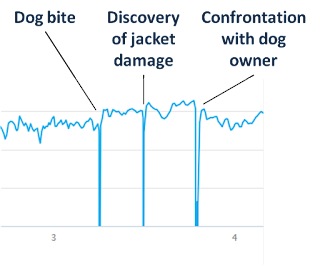 So now I get to buy another running jacket and that makes getting chomped by a giant poodle totally worth it. Wow! First off, I picture you literally running backwards, rather than running the actual route in reverse. Please tell me I am correct in thinking this. Second, I'm glad you didn't get hurt. I am definitely not a poodle person. Their fur is not fun to pet and most of the ones I've met are nasty. Third, I'm surprised that the dog owner agreed to pay and actually followed through. Fourth, did you give him your home address?! Fifth, since he was so agreeable, why didn't you take a picture of Cujo? You could have even renacted the attack! I'm not TPP and therefore cannot run backwards as fast as I run forwards. Have you seen her do that? I would describe it as running the route in reverse. Or in my case reverse-ish. That dog was really aggressive and was as big as a German shepherd. I was running on pure adrenaline by the time I caught up to the owner and didn't think it through when we exchanged info. But I knew he was a neighbor. Turns out the guy had once been over to my house to pick up his son. I didn't take a picture of the Hound of Hades because, as we all know, the devil can't be photographed. You're lucky that you only need a new running jacket. Dogs are so unpredictable. I'm glad it all turned out ok for you. Thanks Wendy. I'm going shopping for two items next weekend: a new jacket with tougher fabric and dog spray. Small world! Funny thing! " Him being over your house to pick up his son". You never know. But shame on him. He should know his dogs behavior. That would never have happened with your dog! How are you doing? Still doing a lot of running? You should join our little group some time. What??? When did that happen? Is everything okay now? AOK. This year, after snow shoveling I was dehydrated & got dizzy. Two years ago I had heart palpitations, too much caffeine. AOK again. 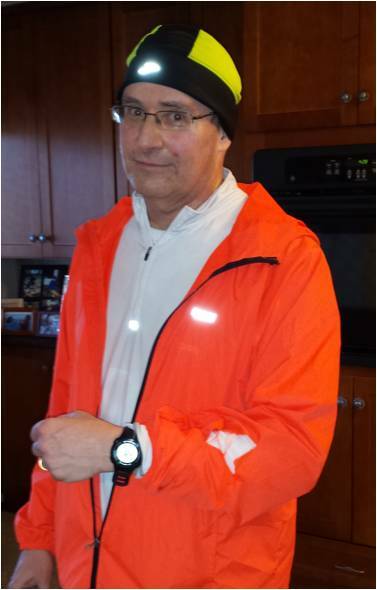 As an "old" guy I did what the running magazines say & got a check-up before starting any rigorous activity.